LIMA, Mar 22 2013 (IPS) - The Peruvian legislature is investigating a contract with an Israeli company, entered into by the previous government for advising and training the military, after audit bodies found irregularities in how it was signed. A congressional oversight commission is investigating three former ministers in the government of Alan García (2006-2011) in connection with the agreement with a private Israeli security company, Global CST. The contract, signed secretly in 2009, was for supporting the military in its fight against a remnant of the Maoist guerrilla group Sendero Luminoso (Shining Path), active in the Apurímac, Ene and Mantaro river valleys (VRAEM). An audit by the comptroller general’s office found that civilian and military authorities had broken laws and regulations in signing the contract with the company, whose founder and director is Israel Ziv, a general in the Israeli army reserve. The investigation concluded that the Peruvian state had lost 16 million dollars because Global CST failed to fulfil its commitment under its contract with the Armed Forces Joint Command. Special anti-corruption prosecutors received the report from the comptroller’s office and in the next few days will open a formal criminal investigation against at least 20 former officials, both civilian and military, from García’s second presidential term (he also governed 1985-1990). The main people coming under questioning by the legislative commission are former health and housing minister Hernán Garrido, former defense ministers Ántero Flores Aráoz and Rafael Rey, and former chief of the Joint Command, retired general Francisco Contreras. “All those involved in the contract with Global CST must answer as many questions as are necessary to clear up this case, which involves former civil and military authorities from the previous government,” the chairman of the oversight commission, congressman Gustavo Rondón, told IPS. “We want to know if it was necessary to bring in a foreign company to train soldiers to fight the terrorists. After taking statements, we will come to our conclusions and send a report to the attorney-general’s office, where a criminal investigation is under way,” said Rondón. After stepping down as minister in October 2008, Garrido joined Global CST in Colombia. The Israeli company was working with the Colombian army which is fighting the Armed Revolutionary Forces of Colombia (FARC). The Colombian contract with Global CST was signed when incumbent President Juan Manuel Santos was defence minister, between 2006 and 2009. On Apr. 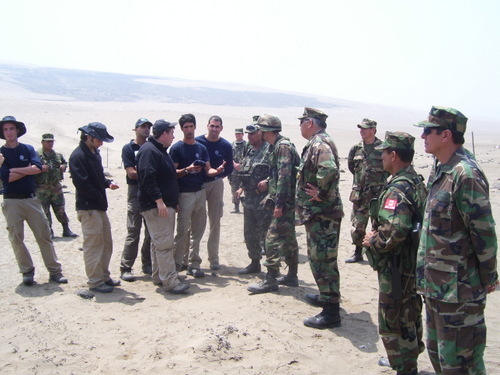 30, 2009, Garrido and Ziv met in Lima with then defence minister Flores Aráoz, to offer him Global CST’s advisory services in the war against the remnant Sendero group operating in the VRAEM. The following day Ziv met with Contreras, the chief of the Joint Command, who from then on conducted the negotiations with the Israeli firm. Five months later, on Oct. 20, 2009, the Joint Command and Global CST signed a secret contract that, according to the comptroller general’s office, was detrimental to the Peruvian state. The company was paid 10.6 million dollars, paid no taxes and got other benefits, raising the state’s losses to 16 million dollars. Sources close to Garrido told IPS that the former minister merely introduced Ziv to the Peruvian authorities, but played no part in the contracting process and was not paid for facilitating the contact. However, after the contract was signed, Garrido provided advisory services to social development projects conducted by the Israeli company in Colombia and Guinea. Former army chief general Otto Guibovich testified before the congressional commission that it had been unnecessary to hire a private foreign company to train elite forces in the VRAEM, because the Peruvian army has plenty of experience. Guibovich confirmed to IPS what he had said in Congress, and that he had met with Garrido and Ziv on Apr. 30, 2009. But he added that he had made no promises, because he had no plans for using advice of the kind being offered. Secret documents obtained by IPS indicate that Global CST, in order to accredit its counterinsurgency capacities, gave the Peruvian government letters from then Colombian defence minister Santos and other senior Colombian officials. But Ziv concealed from his Peruvian counterparts that his company was training, in the same year, 2009, a personal guard for controversial captain Moussa Dadis Camara, who had led a coup in Guinea and governed the country in 2008 and 2009. The comptroller’s office established that neither in the Peruvian Joint Command’s yearly plan of actions, nor in its budget for 2009, were there provisions for a contract such as the one it signed with the Israeli firm. “Convincing evidence that there was a wilful conspiracy to contract the company recommended by a former minister is that the chief of the Joint Command, General Francisco Contreras, requested funds for the exact amount that Global CST had quoted for its services,” they said. The accusation by the comptroller’s office against those allegedly responsible for the irregular contract with Global CST includes a former defence ministry inspector, retired vice admiral Carlos Tubino, who approved the company’s services. Tubino is now a congressman for the Fuerza Popular party, headed by Keiko Fujimori, the daughter of former president Alberto Fujimori (1990-2000), who is serving prison sentences for corruption and human rights abuses. Fujimoristas and supporters of APRA, the party of former president García, are critical of the comptroller’s office’s investigation, even though it has been taken up by the attorney-general’s office. “It’s not an impartial investigation because it is politically motivated. They are trying to discredit the armed forces that are fighting terrorism. We have seen that many of the comptroller’s office’s accusations are baseless,” argued Fujimorista congressman Julio Gagó, a member of the congressional commission.